The focus of my blog is to review book series and not individual novels, but writers are going to continue writing novels within a series even after I have done my review, so I plan on reviewing the individual novels as they come into circulation. William Hertling just recently added book #4, The Turing Exception, to the Singularity series. The term ‘singularity’, for which this series is entitled, was created by mathematician John von Neumann in 1958 to describe an event in which the acceleration of technology surpasses human intelligence and capabilities which results in potentially evolutionary or cataclysmic changes to the human race. The technology that Hertling focuses on in his series is the emergence of artificial intelligence and brain-computer interfaces. The series starts out with the accidental emergence of a sentient artificial intelligence and the chaos that it created for humanity. Once humans have adjusted to the idea that artificial intelligence is here to stay and can even be beneficial, it became clear to humans that control over the AI population is paramount. 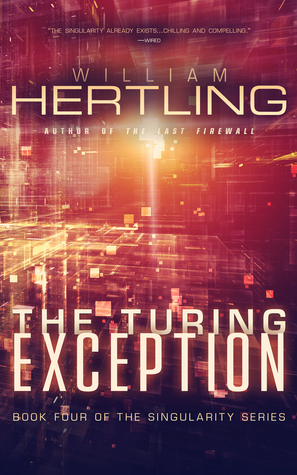 The problem is that the AI beings eventually don’t want to be controlled by humans which lead to Hertling’s latest novel in the series, The Turing Exception. Mike William, Leon Tsarev, and Cat Matthews are back along with their AI friend Helena and a revival of ELOPe. For those of you not familiar with the series, ELOPe was the first sentient AI developed in the series that became close to his creator Mike William and was pro-human, but ELOPe suffered an untimely demise after the second novel, or so it seems. After the events in the third book of the series, The Last Firewall, it is not surprising that Leon and Cat are now husband and wife and their union resulted in a daughter named Ada. The unique aspect about this particular group is that none of them are fully human. Mike William, who originally was all human, now has a robotic body with a human brain and Cat, Leon and daughter Ada all have neural implants permanently embedded in their brains. All of this is well and fine while things have been warm and cozy with the AI population, but the US of A has taken on a change of heart after the military had to take out Miami with a nuke in order to rid the world of an ominous self-replicating pool of nanobots. With the death of millions of humans in Miami, the majority of Americans demanded for the expulsion of artificial intelligence from its shores. With the growing hostility to AI and anything related to it, Mike William and his gang left the country to reside on Cortes Island off the shore of Canada. The creation of AI forbidden zones in the US as well as in China left a bad taste in the mouths of all the remaining AI and with that unrest is the emergence of an anti-human collective known as XOR. From there on, the rest of the novel focuses on the preparation from both AI and humans for a potential Armageddon which leads up to what this series is all about, which is ‘The Singularity’. I first want to say that I love this series and I would highly recommend it; however, I have mixed feelings on the Turing Exception. On one hand, the novel has a great and exciting storyline; Armageddon between artificial intelligence and humans, what more could one ask for? But on the other hand, is the use of an overwhelming amount of techno-babble. Now I am as geeky as one can be, I wear Crocs for goodness sake, but if I had a neural implant like the singularity characters it would get zapped from technology overload. There was a lot of bizarre virtual reality usage which made me feel like I was on a LSD trip. But what was more disappointing was a lack in character development. With the exception of a grumpy Leon Tsarev, who was unhappy that his wife Cat was out trying to save the world while he got to stay home and play patty cakes with his young daughter, none of the characters really got to show much of their inner feelings which was sorely needed to balance the exceptional amount of technology that had infiltrated their lives. One would hope that with the ultimate battle between AI and humans, the desire to root for the humans would be expected, but by the time the ending of this novel came about, it became difficult for me to decide who deserved more to win. And, of course, that leaves us with the ending, which I did not expect but I found rather intriguing, so much so, that I would highly recommend wading through the techno-babble to get to the end. I have read a few reviews that commented that the series ends with this novel, but even though the singularity has been met I believe that there is a ‘back door’ written in the plot and I could envision a post-singularity novel in the future, which I personally hope to see. To learn more about the series check out William Hertling’s Singularity Series. Posted in Technothriller.Tagged Book Review, Book Review Blog, Book Series, singularity, Technothriller, Thriller, william hertling.